Enriched with immense industrial knowledge, we are engaged in offering a technically updated variety of Biotique Bio Margosa Anti Dandruff Shampoo that is highly demanded by the clients . 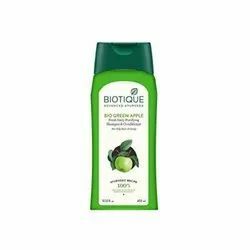 We are engaged in offering Biotique Green Apple Fresh Daily Purifying Shampoo . This gentle 100% soap free shampoo is a natural blend of pure green apple extract sea algae and centella to cleanse delicate hair and scalp without dryness or irritating babys sensitive eyes. Very effective in prevention & control of dandruff. Contains potent herbal agents like Shankhpushpi, Kapila, Tulas, Shikakai, Bavchi, Triphala, Daruhalad, Raktachandan, Jambhul seeds etc. Apply twice on moist hair each time making a thick, rich lather. Wash off with plenty of water after 4-5 minutes. Light massaging of the scalp gives quicker relief. Our reputed entity is engaged in supplying Biotique Green Apple Fresh Daily Purifying Shampoo . This rich shampoo is a blend of pure soya bean protein, berberry and wild tumeric extracts to cleanse hair without disturbing its natural pH balance. Prevents color fade. Protects a perm. Promotes healthy shine. In order to meet excellent quality standards, we are supplyimg Bio Kelp Protein Shampoo .